Well I think my predictions for Ohio State and the Browns this weekend were a little too rosy, for sure. I wasn't cocksure, but I felt wins were in the cards for both teams. However, you can see that my nervousness was there, hiding under the surface. In predicting an easy Buckeyes win, I had the caveat "this game can go a hundred different ways...Ohio State can score 49 points or 3 points and it wouldn't totally shock me." And about the Browns, I wrote "I can't see Colt McCoy being as off as he was last week, so I'm guessing the offensive ship gets righted..."
Well, here's what I think we learned watching two of the most wretched performances imagineable this weekend from our beloved Bucks and Brownies. Sure, Braxton Miller is only a freshman, but there appears to be an immense drop off in talent from Terrelle Pryor to Miller. Miller's average play involves him dropping back three steps, then nearly immediately tucking the ball down in a confused jig, making one person miss, and going down for no gain (+/- 2 yards). I don't even know if he can make a throw down the field. Joe Bauserman, on the other hand, suddenly can't hit the broad side of a barn. I think if he can get in rhythm, he is by far the better quarterback at this point, but coming in like he did against Michigan State, he was underthrowing and overthrowing receivers with such terrible accuracy that I can't believe one of his receivers didn't slap him upside the head. Sure, with Posey and Herron returning this week for the (previously) highly anticipated Nebraska game, the offense can't help but get better. But if the quarterback can't get the ball downfield accurately, it doesn't matter if Calvin Johnson is out there running routes. This is going to be a rough rough rough season, much worse than nearly anyone anticipated. The fact that a shutout didn't go in the record books is an unjust reward for the performance the Bucks gave on Saturday. The defense gave up 10 points. 10 points!! And still it felt like an absolute blowout. The Browns, on the other hand, just completely crapped the bed on Sunday. I can't overstate how frustrated I am with Colt McCoy this morning. Some of it might be the game plan, but his utter inability to target receivers downfield is maddening. 40 completions, 61 attempts for 350 yards?? Only one more quarterback in the league has more passing attempts than Colt McCoy this year. Sixteen have more passing yards. 28 average more yards per attempt than McCoy's 5.7 yards. We could have kept Brady Quinn and gotten this kind of QB play. If you can't pass the ball downfield, you can't open up the run. Not that it matters, because something appears to be sour in the Browns backfield. At first, the shuffling of Hardesty and Hillis on Sunday excited Browns fans, as both saw success. But then it was all downhill. Hillis sure might be in the Shurmer's doghouse, as whispers were rampant that the team (including other players) thought that contract status, not just strep throat, helped keep Hillis from playing vs. Miami. The Browns appear to have two very competent runners. And they found some success early. But at the end of the day, they had 17 runs and 60+ passes. And the discord was clear in postgame comments by both Shurmur and Hillis. The fact that Hardesty seems to have hands of stone out of the backfield, and Hillis is one of the better pass catching backs in the league, just adds to the frustration with the substitutions yesterday. Finally, Browns, make a damn tackle. Long touchdowns blew this game open for the Titans. 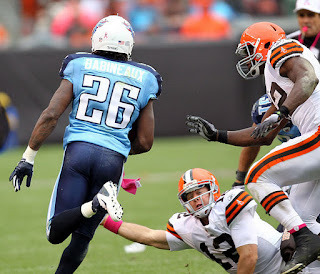 The Browns defense did a good job on Chris Johnson, containing him well all game long save one long run. But the early long touchdowns to a tight end was inexcusable--Usama Young, make that tackle. And more damning, when Titans' safety Jordan Babineaux intercepted a McCoy pass at the three yard line, the Browns made little effort to catch him and that 97-yard TD sealed the game. Disgraceful, and I hope the offensive team has to run steps all day today after watching that tape. Things are not good in football land today. And with the Indians home for the season, and the NBA season looking less and less likely, options are few for fall activities. I guess those gutters will get cleaned out, after all.